Today is the feast day of Our Lady of the Rosary, so the girls and I made new rosaries last week. 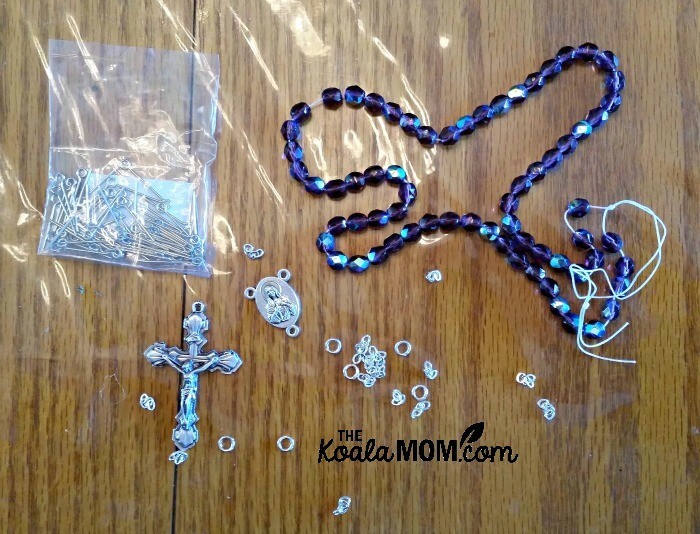 It’s actually quite easy to make a rosary; all you need is a cross and a few beads, and after that the rosary can be as simple or as fancy as you want to make it. I did some research looking for rosary supplies and came across Design My Rosary, a family-owned company that creates custom rosaries. 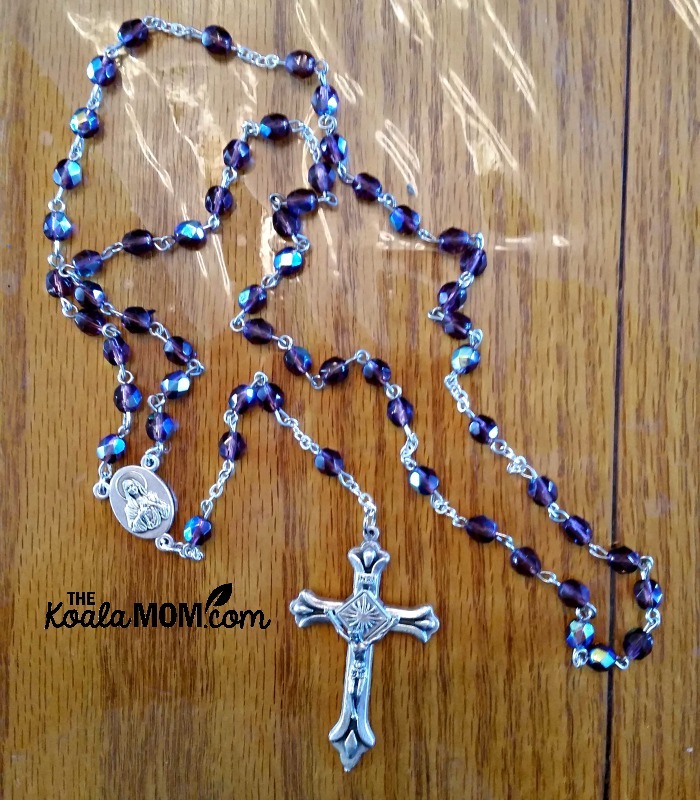 You design your rosary on their site and then you can either make it yourself or have them make it for you. They sent us two rosary kits with all the supplies needed to make our rosaries: beads, cross, medal, pins, and spacers. 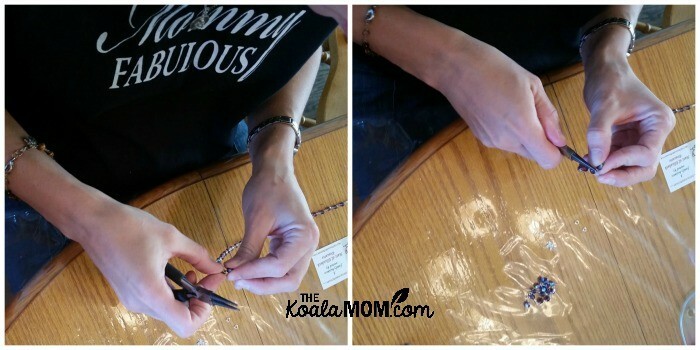 You will also need needle-nose pliers to make these rosaries (which I had from my teenage beading days). After that, the rosary is quite easy to put together; Sunshine and I made hers in about half an hour. Sunshine was delighted with the sparkly purple beads I picked for her. There were so many options on Design My Rosary that I got a bit overwhelmed. I thought about asking the girls to come pick what they wanted, but then I worried that I’d be there all afternoon. I finally looked up their birthstones and picked beads that way. So Sunshine’s beads are amethyst and her cross and medal are silver, while Lily’s beads are emerald (glass) and her cross and medal are gold. This craft project was a bit more difficult for the girls. I realized that Sunshine wouldn’t be able to use the pliers, so I ended up doing most of the work of her rosary. 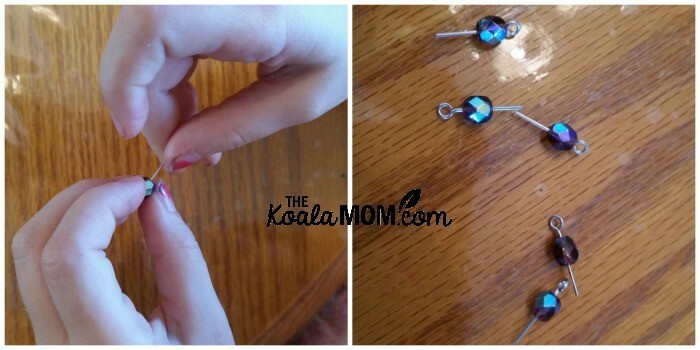 I got her to put the beads on each pin. She had fun with that, especially when she got ahead of me. When we were finished, Sunshine was so excited with her new rosary. She couldn’t wait to show it off to Daddy when he came home and she asked him to pray a rosary with her after supper. Lily’s rosary uses large wooden beads, with white beads for the Our Fathers. It was easy for her to string and looks quite handsome. At the kids’ camp, Sunshine made a rosary with pony beads. She used darker beads for the Our Fathers and made a knot in her cord between each decade. For younger children, this would be an easy craft project. You’d just need to get a cross—or even possibly make a few crosses out of salt dough. 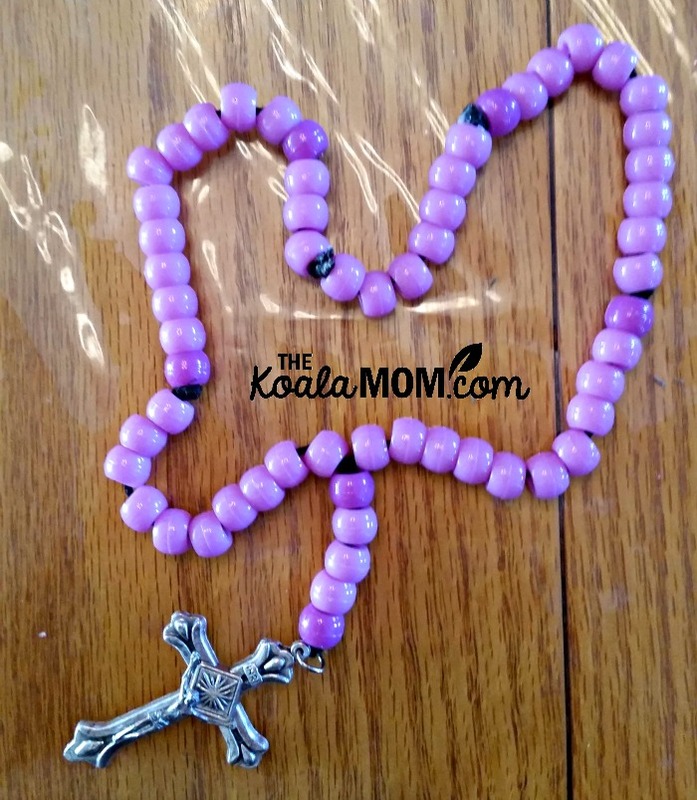 So there are a few ideas for creating rosaries with your children, depending on their age and crafting abilities. 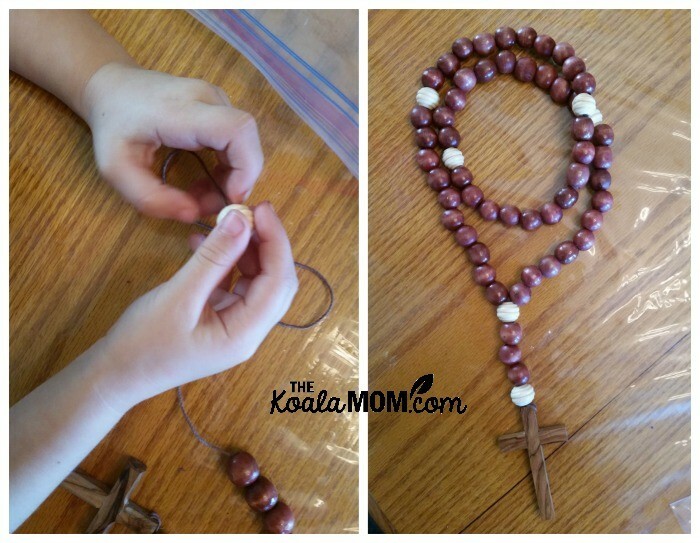 While you’re making rosaries, check out my tips for Teaching Children to Pray the Rosary. Design My Rosary also has a beautiful Rosary Guide and CD. They sent me a couple copies along with our rosaries; if you want to win one copy, just leave a comment below about what the rosary means to you.